The past week has been filled with family celebrations; meals, gifts and more meals and gifts. Lynden once again was the host to both our extended family gatherings. 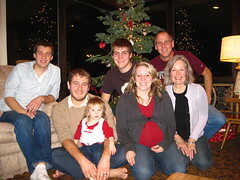 Since the bulk of both our extended families are in Lynden, we are fortunate to have it all in the same town. My extended family all gathered at my nephew Aaron's house. Everyone was there except Jonathan who had to work in Illinois. A real treat was to meet Kate, Brian's fiance. It was strange not having Mom there and thinking of her alone at the Courtyard. The Eide family moved through the progression of traditional meals in a round robin on the compound. Bria was absent, but enjoying a Christmas in Norway. We all went to Bjorn and Jenny's church for a candlelight service. Back in Southworth, Bjorn, Jenny, Ada and Ellen are spending a few days with us.